Phoenix, AZ (April 8, 2014) – Ensemble has negotiated the $2.4 million sale of Camino Del Sol Dental Plaza, an 8,395 square-foot medical office building located at 13802 W Camino Del Sol in Sun City West, Ariz.
Tracy Altemus, Marina Hammersmith and Autumn Storm of Ensemble’s Phoenix office represented the seller in the transaction. The seller was Camino Del Sol One, LLC. The buyer was Geiger Boulevard Spokane, LLC. Built in 2000, Camino Del Sol Plaza is located in the heart of Sun City West’s commercial core and is close to the Del Webb Hospital. 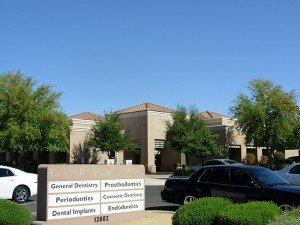 At the time of sale the building was occupied by four well established dental practices including general dentistry, prosthodontics, periodontics and endodontics. The building was 100% percent leased at the time of sale.